This article originally appeared in the December 2011 issue of Western Friend, focusing on Quakers in the Arts. Reprinted with permission from Western Friend. Does my spiritual life inform my work as an artist; or does the creative process of making art inform my spiritual life? Perhaps it is both, like an ongoing dialogue. I seek to articulate the Light, the universal metaphor for the Life Force within and all around us; Light as a descriptor for that which is Sacred and Holy which permeates each breath. The language of articulation involves use of line, light and shadow, color, shape, rhythm and texture to describe the internal response to being alive. I work in several media: drawing, watercolor, and hand woven French tapestry. My hands know much about the feel of wool and silk yarn, Aubusson tapestry technique, and the proper tension of a good warp. I sit at a loom built out of oak and walnut. Being a low warp, a horizontal tapestry loom, it occupies a substantial amount of floor space. Its weaving width is four lames, or sixty-three inches. The term, “lame”, refers to the amount of warp in forty centimeters, or the width of one weaver’s shoulder. I am one weaver sitting at a loom that could fit four. This loom is my place of refuge for what needs to emerge from deep within. I lean forward against the front beam to reach toward the loom’s center for the warp threads grouped together in a slip knot. The cotton twine is strong and smooth in my fingers. I separate out six strands, pulling each one firmly, dividing them in half, looping them around the rod at the front beam and tying them in a weaver’s knot. I reach for six more warp threads and repeat the process. Each thread must have the same tightness as the one beside it, in order to have an evenly tensioned warp. This is the foundation for a tapestry cloth of good integrity. As my fingers reach, pull and knot, I think of how often weaving and tapestry are used as metaphors for the pulling together of many disparate elements into one complex yet integrated whole. Often seasoned mystics and leaders of workshops use “tapestry” as a way of describing the spiritual journey. Although many are not weavers and thus do not know what goes into the making of tapestry cloth, it is still a powerful and apt metaphor. It becomes even more vibrant when one engages in the daily meditative practice of weaving and knows experientialy how the moment can expand into eternity through the window at the loom. 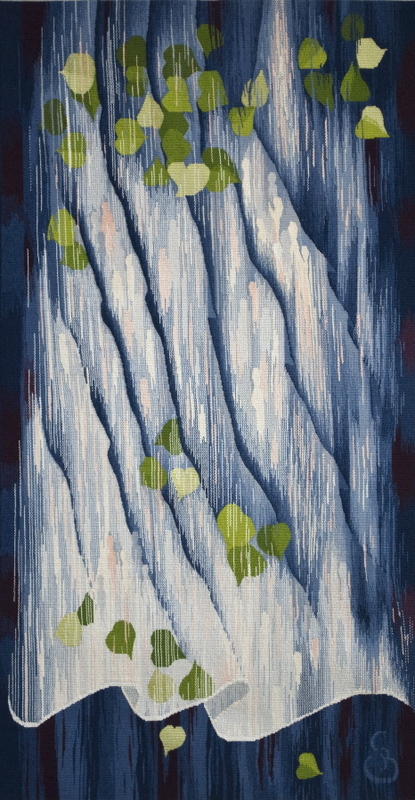 I am a second-generation tapestry artist, who has been weaving for over forty years. My mother showed my ten-year-old hands the realm of threads moving over-and-under taut warp, to create shapes and forms imbedded in woven cloth. With this, I entered into the stream of mythic figures weaving the world into being; of master weavers who passed this tradition down through the generations since time began. Over the millennia, in regions and cultures all over the earth, old and sometimes gnarled hands have shown young small hands the feel of an evenly tensioned warp and the arc of the weft to insure a straight selvedge. Each time our hands pick up yarn and place it between taut warps, we engage in an archetypal discipline and practice honed over many centuries, days and hours. In the ensuing years, I have come to view the loom as a threshold. Each time I sit there with my fingers moving strands of color through the warp, I enter into a place beyond words, not unlike silent meeting for worship. Weaving becomes an act of prayer. I often slip into a meditation and a connection with forces at work far larger than me. While my fingers are in constant motion, I enter into a place of reverence and quiet listening. Here is where I can sense the internal stirrings that also embed themselves into the fibers of the tapestry. This is where nudges and leadings often make themselves known. Sometimes it is the pull to try another color here or to round out this shape more. Sometimes it is the spark of an idea for the next tapestry. Sometimes it is a knowing that I need to speak with a friend. Strand-by-strand, section-by-section the colors of the weft create shape and form. Foreground and background link with the warp threads so taut on the loom. The woven structure cannot be sacrificed for the image. The image must flow gracefully, in harmony with the techniques required for sound cloth. Thus, the integrity of tapestry cloth and the emerging image become inseparable. So too, does the integrity of my spiritual practice become inseparable from the outward form of my life. They are interwoven somewhere deep inside. The act of deep listening happens away from the loom as well, when ideas for designs begin stirring from a place deep within and start working their way through my hands into initial drawings or watercolors. It is like I am coxing them forward into being. This process cannot be rushed. In the solitude of my studio, prayerful listening takes me along unexpected paths, as I follow what seems to be leading me. Sometimes it feels like a dead end; other times I seem to be heading somewhere fruitful. Always it is an act of trust and faith in what is unfolding, and requires focused attention to the Truth of what is taking shape. Often this process of ideas taking shape and form happens over the course of days and weeks, with many breaks away to work the day jobs and do the tasks of daily living. Once the idea is crystallized and ready, I begin weaving and interpreting my black and white sketches and value studies into the palette of yarns and the language of the loom. 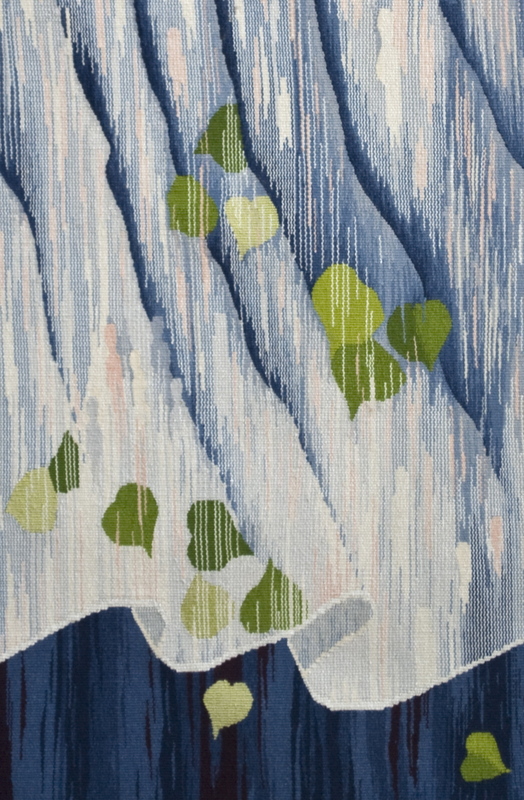 Many details and subtle changes happen while weaving, as the tapestry informs me what needs to happen next. The techniques I use are specific to Aubusson French tapestry tradition, and I see only the back of the tapestry slowly growing before me. Often it takes about 400 hours over the course of a year to complete. Only when I cut it off from the loom can I first view the tapestry in its entirety. It is indeed like a birthing: one that has come through me, but is not of me. If I have listened well, the tapestry sings. I look at my hands in awe. I think about the residue of memory that I carry in my fingers, not only of each woven strand, but also of my mother’s hands and those of the French master weavers who honed my skills. The stream of time flows forward and back, ebbs and flows through these hands, stories, and lives of previous centuries. What stories rest in silence, until a moment of illumination? In many ways, the creative process is one of awakening that which has been dormant and hidden within. What invites the glow of light into the darkness, so that the story’s voice can be seen and heard? For me, the invitation comes through engaging in the prayerful dialogue that informs both my spiritual life and my work as an artist. Time, in all its layers and dimensions, becomes integral to the process of tapestry making, as well as in the unfolding life of the spirit. Time is thematic in my work as an undercurrent: time in terms of millennia; time of the forces which molded earth’s canyons and mesas, oceans and mountains; time filled with the presence of those who have come before. I continue seeking to articulate the Light.